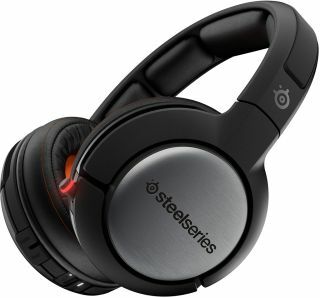 If you check out our picks for the best wireless gaming headsets, you'll find the SteelSeries Sibera 800 leading the pack. About the only thing it's missing is Bluetooth connectivity, which SteelSeries has now rectified with the release of its new Siberia 840. The Siberia 840 uses the same set of cans as the Siberia 800 and sports the same features, such as cross-platform compatibility, Dolby 7.1 surround sound technology, and two swappable lithium-ion batteries to keep the audio pumping indefinitely (each one is rated for 20 hours of use). But with Bluetooth added to the mix, SteelSeries says gamers don't need to turn to a different headset for listening to music or chatting on the phone. "The Siberia 840 not only delivers the same detailed sound quality as its predecessor, but also incorporates Bluetooth connectivity for true universal mobile compatibility," said Brian Fallon, SteelSeries Category Manager, Audio. "It is no longer just a gaming headset, but a flawless audio system that gamers can use to listen to music and even answer calls." Assuming the Siberia 840 really is the same as the Siberia 800, which itself was formerly known as the H Wireless, it's another compelling albeit pricey option from SteelSeries with a $330 (€349) MSRP. While the cost of entry is steep, comfort and sound quality are both high points that help justify the price tag. The Siberia 840 consists of a memory foam padded closed-cup design with on-earcup wireless controls for making quick adjustments. And like its predecessor, the Siberia 840 seems to be short on tacky bling. The Siberia 840 is available now direct from SteelSeries. If you don't need Bluetooth connectivity, the Siberia 800 can be found on Amazon for a little over $232.